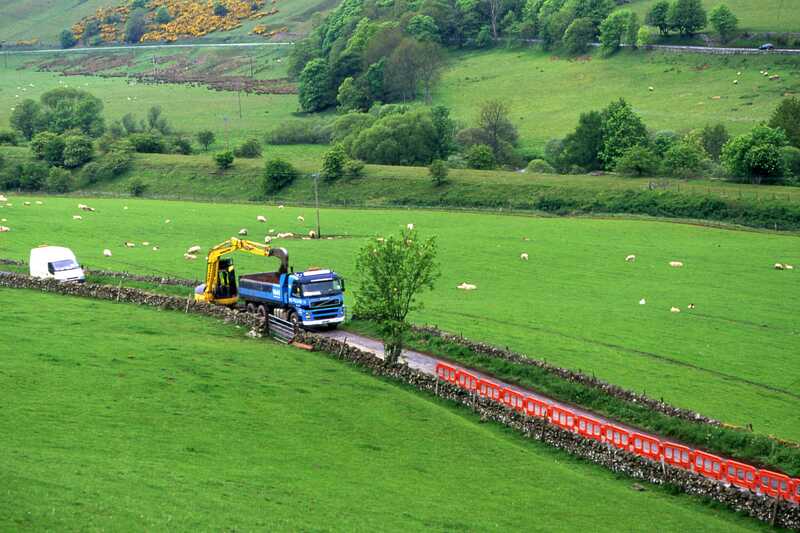 Work started on Monday May 24th to lay a new water main along the Stow to Fountainhall minor road, replacing an existing main laid in the railway formation between bridge Nos. 67 (crossing of the Gala Water at Galabank) and 68 (Station Road overbridge), a distance of about a mile. The works are scheduled to take ten weeks and like most of the utilities diversions which may or may not have been carried out since this phase was inaugurated by Transport Minister Stewart Stevenson in mid-March, there is no activity on the actual trackbed, so it is not at all obvious that the work is in connection with the Borders Railway. The first image shows the work on 31st May. Excavation of the trench for the diverted water main had reached a point a few hundred yards north of Stow station, seen here from the hillside on the south side of the Gala Water valley with the railway embankment in the middle distance and the A7 road beyond that (view looking to the north east). 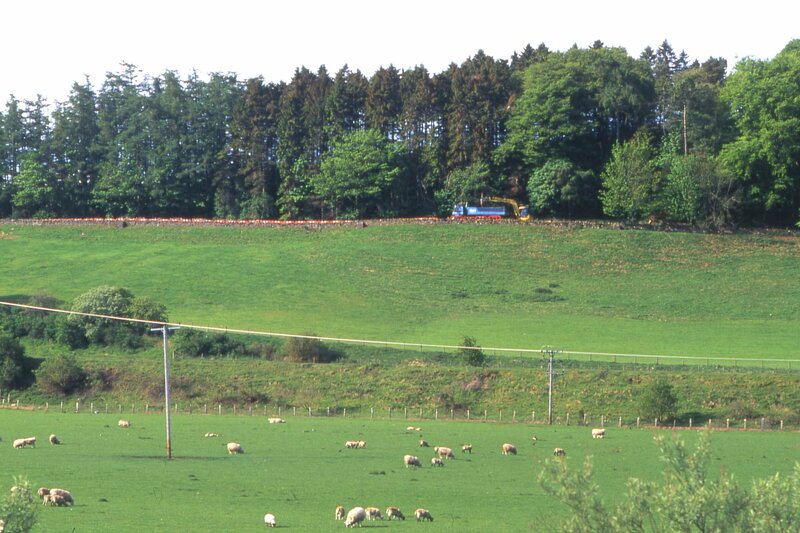 It is worth commenting that this is an expense which need not have fallen on the railway, as reinstatement was already on the agenda back in the late 1990s when East of Scotland Water replaced the local supply at Fountainhall with water pumped up the Gala Water valley from its Meigle facility at Galashiels. There was presumably some cost saving in utilising the railway formation rather than going along the road and in the absence of appropriate legislation to protect disused railway alignments, ESW was quite entitled to pursue whichever option suited it best. The writer was able to persuade ESW to lay the new main on one side of the formation rather than right down the middle but the single track envisaged at the time has now changed to double track in the Stow area making diversion of the main unavoidable. Towards the end of the week commencing 24th May, excavation had only proceeded about 200 yards. The second image shows the work from the north side of the valley (from my front bedroom window actually) with the railway embankment in the middle distance. Bridge no. 68 and Stow station are just off to the left.